I've kept and bred all the snake mentioned and I would have to say, experience prevails. I currently have 16 green trees in my collection, and only 2 have the stereotypical bad attitude. The rest are docile as can be.........even an adult import female. I've had corns that had demonic temperments equal to juv. macklots pythons. I really think GTP are an exception to the rule of aboreals being nasty. They actually require less maintanance than my colubrids. I'm not saying they are good beginner snakes, but they aren't what most people make them out to be. They are awesome creatures, and I can't get enough of them. As for Rings.......another easy captive, and the some of the best feeders I've ever seen. Average adult size is 5', but there are exceptions, just as with any species. There are plenty of captive rings, you just have to get them from the right breeder at the right time of the year. Not flaming you, just a little info from experience. 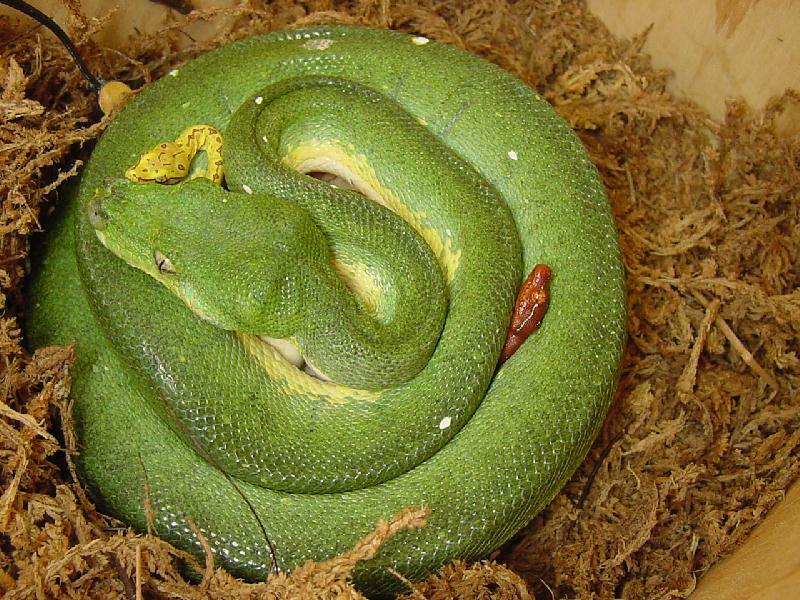 :I wouldn't suggest a GTP for a beginner snake because first of all, they are NOT as easy as a corn, or a ball. Second, they are dramatically different in temperament and price than a corn or ball. The majority of arboreal snakes have bad attitudes and GTPs are not an exception. I also doubt that someone will be willing to shell out $350 for their first snake which is basically a display animal anyways. I don't know much about ringed pythons, but I have heard they are not easy to care for, rarely CB and they get fairly good-sized (6-8 feet). I'm not flaming you, just tryin to help.